Please use the following downloadable files to help your Printing Business save time and money. 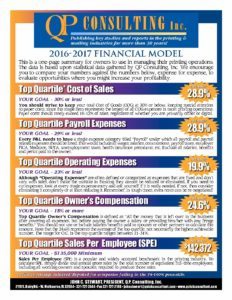 Here’s a brand new chart that you can download that lists specific goals to help you become a profit leader in this industry. Download the PDF of this chart here. This spreadsheet was revised 11-08 to incorporate help windows for the data entry. We frequently stress the critical importance of being able to compare your key financial ratios/percentages against other similar size firms. However, in order to do that it is necessary that everyone be on the same page when comparing percentages for categories such as cost of goods, payroll percentages and overhead expenses. That chart of accounts not only establishes a basic layout or standard format (sales, cost of goods, payroll, and overhead) for a profit and loss statement, but also specified the minimum expense “categories” that firms should attempt to breakout. Using the standard chart of accounts, NAQP surveys the industry every two years and publishes an extremely valuable document known as the Industry’s “Operating Ratio Study” or a Financial Benchmarking Study. Click here to view a PDF of one page from this valuable study. Contact NAPL to order your own copy.